With IdSurvey you can quickly insert quotas in your survey to check data collection focusing on specific quantities. Quota management is available for all methods: CATI, CAWI and CAPI. “Normal” check: the check is only performed at the beginning and at the end of the survey or in pages with the “Update contact field” function activated. “Aggressive” check: the check si performed after each page of the survey. IdSurvey manages both simple and stratified quotas based on an unlimited number of parameters. You can set quotas on contact variables already known and/or on variables collected during the interview. In this case you will have to use the function “Update contact field”. For CAPI (face-to-face) module it is necessary to synchronize the data with the server in order to update the quota progress. The progress is available in real time for CATI and it can also be monitored by the CATI interviewers from their interface. You can add quotas in your survey manually with GUI or you can import quotas from a file in “Quotas Settings” section. To insert quotas in your survey via GUI, go on “Quotas Management” section of the survey menu and click on the “+” button on top left to add a new quota. The page you display is the quota editor where you have to complete all fields to create your new quota. Description: is the title of the quota that identifies the values requested. Color: is the color you can pick and associate with a certain quota. Required: is the number of interviews required to complete that quota. 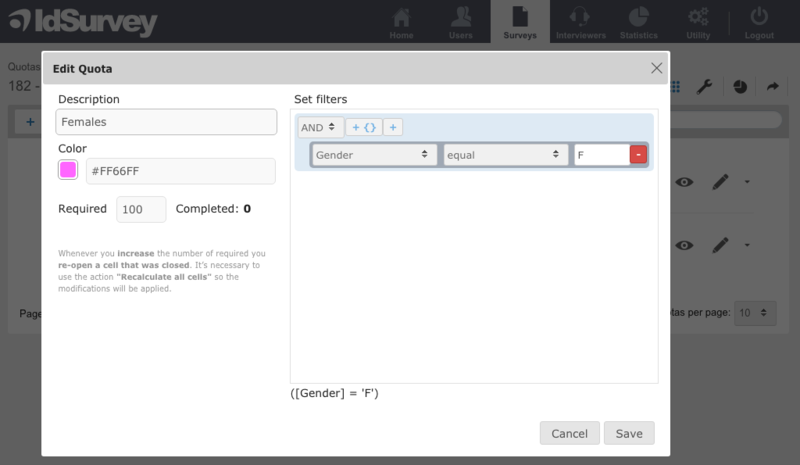 Set filter: is the editor you have to use to set parameters for your quota. To add parameter(s) click on the “+” sign. From the first drop down menu select the field where the value that identifies your quota is saved. The second drop down menu is to select the symbol to build your quota. The third text box is to write the value that identifies the quota and that is present in field selected in the first list. You can stratify multiple parameters for the same quotas by adding more conditions with the “+” (for example, females from “Zone” Europe). Quotas can be also imported into the “Quotas Settings” section using an Excel file. Description: enter the name of the quota with no space. Color: enter the color code to associate with the quota. Name of the field(s) to create the quota: enter the name of the field or fields (if stratified quota) to insert values. Required: enter the number of required contacts necessary in order to complete the quota. Once you created your file you can import it on the “Quotas Settings” page. Click on the gearwheel button on top left of the page and then on “Insert”. Click on “Upload” on top left of the upload window, then “Add file” to select the Excel file from your computer. Click on “Upload”, then “Close” when the procedure reaches 100%. Click on “Insert”, select the Excel sheet then click on “Insert data”. Wait for the upload procedure to be completed and close.